Open your pantry. Chances are you’re going to have some product with Bag in Box Packaging. 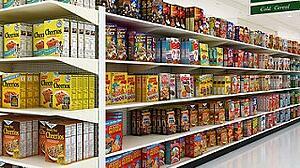 Cereal, crackers, cookies, pasta meals, and more! These Bag in Box products are first packaged in a pillow bag and then encased in a carton providing the packaging style that is so familiar to any grocery experience. Out of all packaging types out there today, the Bag in Box evokes the most nostalgia for me. I can remember watching cereal or snack commercials on TV and pleading with my Mom to get the one with the rabbit or the one that had the toy inside. I see those boxes today and picture my 7-year old self giddy with excitement when my parents brought what I asked for home. As I have changed, adapted, and (hopefully) progressed over the years, so has innovation in packaging and design. The future of the Bag in Box has come in to question on multiple occasions and through a variety of forums. Is this format going anywhere? Let’s take a more detailed look into the timeline of the packaging style and relevancy of the Bag in Box for today’s market. We see the origins of the bag in box concept with the creation of Cracker Jack’s triple proof wax sealed cardboard containers by Harry Eckstein in 1899. The advent of paperboard cartoning or the bag-in-box, however, is often associated with the Kellogg brothers and their flaked cereal. As this product started to be produced on a large scale, the original packaging was, interestingly, a wax bag, known as WaxTite, encasing the carton. Eventually, Kellogg would convert to the now typical plastic bag inside a carton also known as, the Bag in Box. In 1961 Rovema created the Bag in Box concept for the first time. This packaging line typically consisted of multiple VFFS machines feeding a horizontal cartoner with pillow bags. While the plastic bag provided a hermetic seal that kept the product fresh, the carton provided structural support, protection, and a marketing platform for the product as well as a speedy solution at a lower cost. With the advances in packaging and rise of stand up pouches within the last 15 years, many companies and consumers are starting to see the advantage of using a variety of stand up pouch types instead of traditional packaging methods. The bag-in-box is still the key packaging method for items such as snack food and cereal, especially in the U.S., but will it continue to hold its position? Let’s evaluate its role in future production by analyzing how it fares with current trends and industry progress. There is no doubt that if you were able to discard one of the two packages associated with the Bag in Box, you could eliminate a large amount of waste. With the emergence of sturdy stand up pouches and their recloseable features and various applications, this has become a viable, cost-saving option. Currently, we are noticing this transition on the shelves with Ritz toasted chips and Wheat Thin popped or toasted chips products to name a few. One brand in particular is making a pointed effort to veer away from the Bag in Box, although they do this with mainly pillow bags. Malt-O-Meal packages most of its cereals in plastic bags and reports a 75% reduction in packaging waste through this method. In addition, it is efficient from a production standpoint because they are packaging items only once instead of twice. Since it takes 345 million pounds of paperboard to make cereal boxes for a year, the environmental impact in energy, material, emissions, wastewater and fuel is notable. In addition, Malt-O-Meal also works with TerraCycle to recycle their packaging. As companies become more and more environmentally friendly, there have been efforts to fuel recycling movements by providing options or opportunities to enable the consumer to go green. Portability is a priority for today’s on-the-go lifestyle. Efficiency and ease are important characteristics for our busy culture. The flexible pouch is making the consumer’s lifestyle more convenient. The variety of designs, applications, and shapes lend to a grab and go routine. In a recent study, 92% of surveyed consumers said that cereal in flexible packaging was “very different” or “unique” and 90% said they would replace the typical boxed cereal with a flexible, recloseable stand up bag. Not only does the stand up pouch provide an easy carry solution, but it also provides a package many consumers prefer. On the flip side, the ability to stack cartons and maintain protection when being stored or stocked in this fashion is undeniable. The bag, with its irregular shape, is unable to accomplish this feat in most cases. The box is great for marketing. The pouch, however, has been recognized for its ability to provide that eye popping and unique billboard effect. The pouch design and shape can be used to market the product. It is highly customizable and can use a variety of printing techniques and finish. What medium do you think provides a better marketing appeal - the box or the stand up pouch? Is the Bag in Box going through a crisis or will it continue to weather the current trends and innovations in packaging? Or will it evolve as well? I’m still waiting on the interactive audio/visual cereal box shown in Minority Report.